Intense. Poignant. Moving. Powerful. The twenty short plays in this collection cover a broad spectrum of dramatic situations, including revenge, abuse, loneliness, homelessness, eating disorders, death, and relationships. 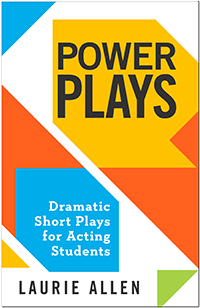 With moods ranging from sentimental to hard-hitting and from heart-warming to heart-wrenching, the wide variety of topics provides ample opportunities for actors to explore stunning character arcs. These short plays, varying in length from 8 to 15 minutes, are all set in the present day and have cast sizes ranging from two to seven. Designed for optimal ease of use, each play comes complete with a synopsis, cast of characters, setting, and prop list, while the table of contents indicates the cast size and topic. Read more...Intended for actors high school age and older, most characters are in their teens or twenties and use language realistic for the situations with some mild profanity. Laurie Allen packs an incredible punch into each and every one of these scenes, making these short plays ideal for contests, a dramatic showcase, or as a conversation starter on a specific topic.